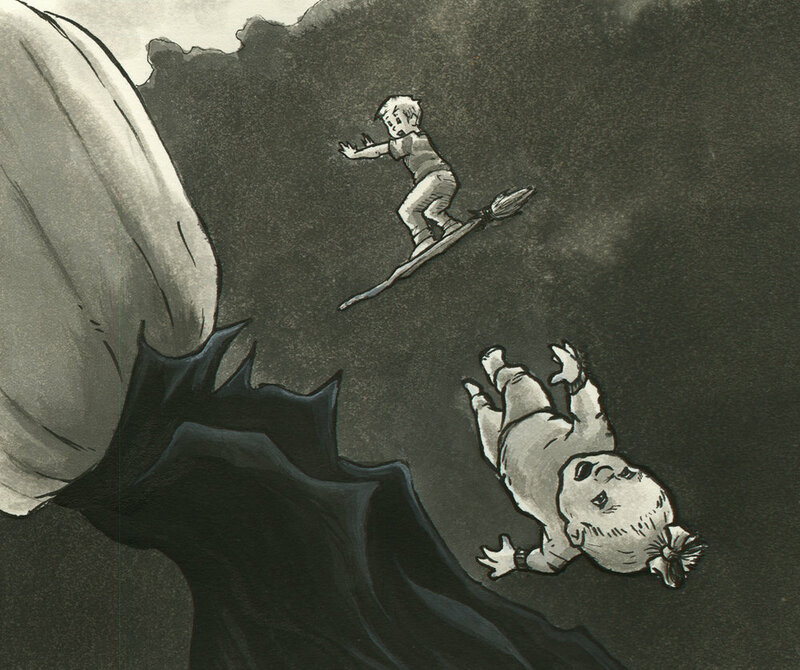 For this year’s Inktober I wrote and illustrated a short comic about my nephew and niece. I posted on social media every two or three days as I finished each illustration. It was very disjointed and probably hard to follow… so here it is in its entirety to you, my faithful readers. Enjoy! It had been a rather uneventful evening when Jwalk and little Kennedy found the plug. 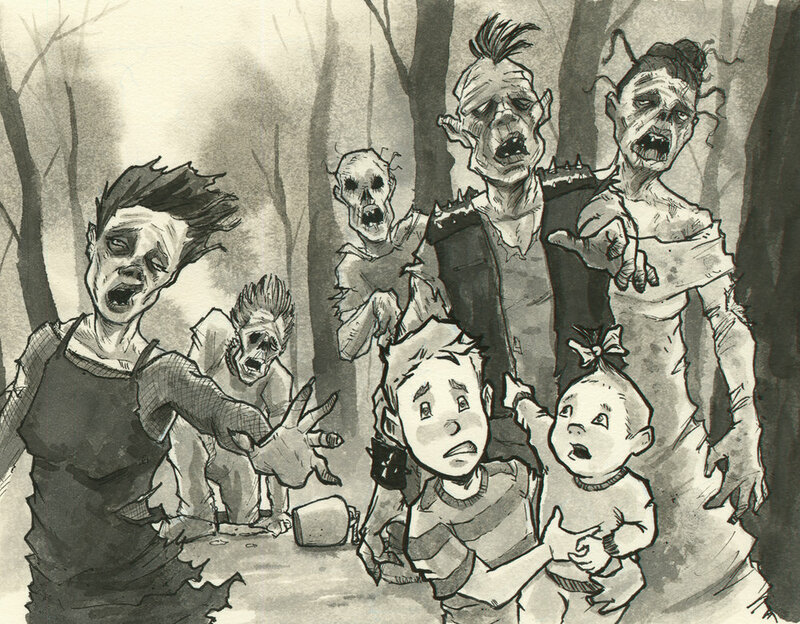 Jwalk would of course have put the plug back, but a horde of zombies burst from the hole and began to chase the siblings. After the zombies, some rather unsavory clowns with their gnashing balloons crept out of the crevasse. But it was when the witches flew out of that hole that Jwalk and Kennedy decided it was time to get the heck out of those woods. Having taken control of the witches broom, the siblings marveled at the march of monsters beneath them. 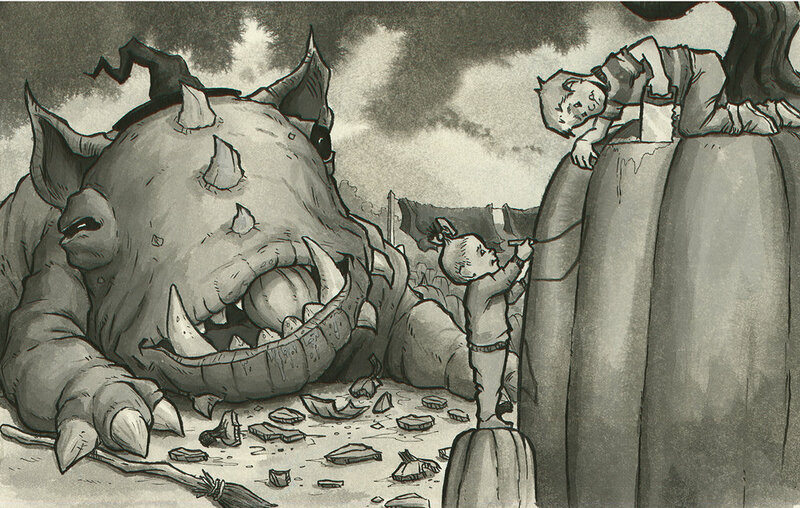 Goblins, creeps, ghouls and all manner of monstrosity, large and small, crawled over the earth. Jwalk and Kennedy knew that they might be spotted by the witches if they tried to escape by broom. Kennedy found one of the largest monsters and demanded safe passage. Believing Kennedy to be a most fearsome witch, the monster agreed. They escaped the chaos, knowing that it was their responsibility to fix what they had wrought, but first they needed to regroup. Kennedy named their monster Rafi. In the calm of the pumpkin patch, an idea began to form in Jwalk’s mind. They worked through the night, ready to put their plan into action. If this didn’t turn the tide of terrors that was still spreading, they didn’t know what would. An engulfed, evil entity rose into the night sky behind the monsters. They turned and stared in wild wonder as this new master hovered above them. It was the fiercest creature they had ever seen and they would follow its dark pursuits wherever it led them. The monsters followed the flaming, pumpkin headed wraith back into the woods. Rafi remained in the rear, corralling the stragglers, as Jwalk and Kennedy controlled the wraith from under a sheet atop their stolen witch’s broom. All was going according to plan. They positioned the wraith above the hole, Jwalk gave the pumpkin a mighty push but then the unthinkable happened! 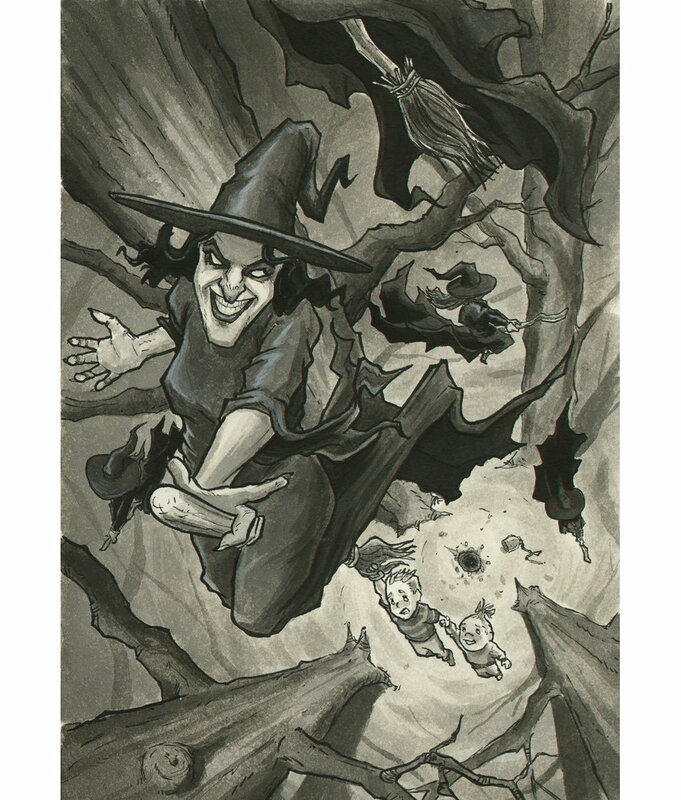 Kennedy plummeted off the broom toward the evil creatures below. It was an impossible catch. One that could have only been made by the love of a sibling. They danced in the air for a moment, as the horde of monsters shuffled toward the opening. Their plan worked. Each witch, goblin, zombie, clown, creature and every manner of monster followed the flaming pumpkin into the pit, descending into the darkness from whence they came. With the danger passed, the siblings snuggled up on their new friend Rafi. They took comfort in the stillness of the moon, knowing that it was only temporary, for new adventures waited beyond the horizon.